As part of his social history of Upper Canada around the time of Rebellion of 1837, Canadian historian J.L. Morison wrote this passage in 1919 by quoting from testimony taken in 1836. 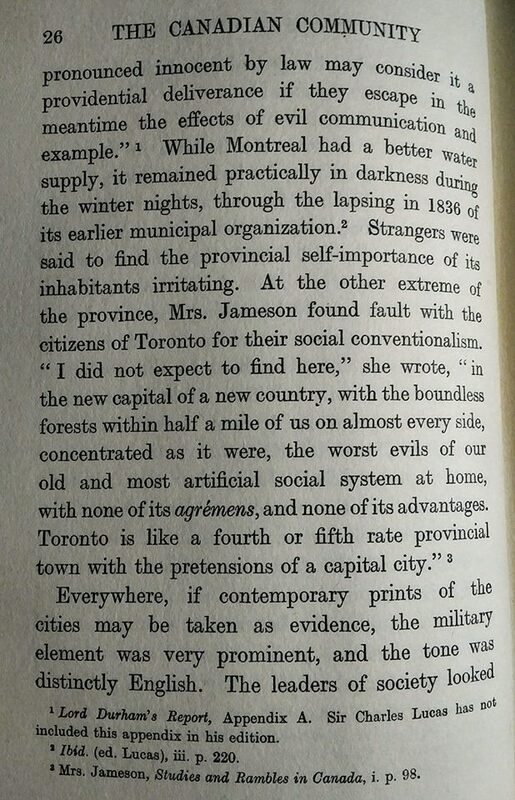 Even back then, Torontonians demonstrated their characteristic — and more importantly, undeserved and unwarranted — arrogance and self-obsession. Toronto is like a fourth- or fifth-rate provincial town with the pretensions of a capital city. If anything, this lends credibility to Hartz’s Thesis on Fragment Societies: the city’s first Loyalist inhabitants who settled there en masse in the 1780s and 1790s brought with them from the 13 Colonies a mirror image of American Exceptionalism and Counter-Manifest Destiny — all the self-importance but with none of the real power. Torontonians even use the pronunciation of their city as a shibboleth and mark of distinction. Toronto — and I say it /təˈɹɒntoʊ/ — has always been thus.